Aura Whisper is a dragon shout that reveals nearby mobile entities, similar to the Detect Life spell effect. Aura Whisper will reveal both NPCs and creatures. Unlike the Detect Life spell, it does not show if the entities detected are friendly or hostile. Although this shout is much quieter than the others, it is not silent and can alert enemies to your presence. 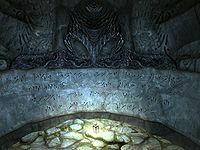 Detecting Daedra, Dwarven Automatons, and Ash SpawnDB, which are not visible with either the Detect Life or Detect Dead spells (some Ash Spawn are said to be detectable with Detect Dead). Determining whether bodies in a crypt are draugr waiting for unwary adventurers, or just harmless mummified remains. Hunting animals in the fields of Skyrim. Aura Whisper has a range of 300ft indoors and 500ft outdoors. If you learn the first word of the shout at Northwind Summit or Volunruud and then go to Valthume, you'll learn the third word next, but it won't appear in the shouts list because the second word hasn't been learned. After this, the word wall for the second word in the remaining location won't work at all (the word wall sound effects are played, but nothing happens when it is approached). You can learn the missing second word using the following console command: player.teachword 60295. The associated word wall will remain bugged, though, and continues to play the sound effects. Sometimes after using the Aura Whisper shout, various visual effects may be permanently applied to your character, such as draugr eyes. Text saying "was equipped" may accompany the adding of the effects. This may be fixed by transforming into a Werewolf or Vampire Lord. You can fix your character's eyes by opening the console and using the following command: player.addspell 000f71d1. Close the console, then reopen the console and enter the following command: player.removespell 000f71d1. Note that this fix may not work in third person view, so try to do it in first person. This page was last modified on 24 June 2018, at 16:50.